When downloading the APASlight you are automatically issued an trial version valid for 30 days. After the expiration of the trial period the software has to be registered before the APAS system can be further used. The registration is very simple and requires only a few steps. After the trial period has expired a small window appears on the screen an no software module part of the APAS system can be used. In the small window click the view site code. 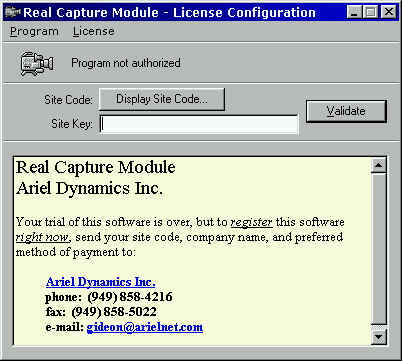 Copy the code and send an email to gideon@arielnet.com with arrangement for payment of the software product. After payment of the software a site key will be send to you. The license for the APAS system is specific to the computer and directory it is installed in. If you move the APAS system, even to another directory, you also need to move the license. See Moving a license for information. A copy of this program must first exist on the destination computer. If one does not already exist, copy the files before performing a Transfer Out. Bring the disk back to this computer and press Continue Transfer.  This program will now be authorized. If there is a significant time delay between the time when the Transfer out of computer is started and the time it can be completed, you can push Continue Transfer Later. When you are ready to continue, select Transfer into computer again from the Transfer menu and follow the instructions on the screen. Generated on 4/25/2019 1:45:06 AM (PST) ADI/HQ/GBA/2019/ARIELCLOUD/v3.0.2018.0126.